Click on image to get your copy. 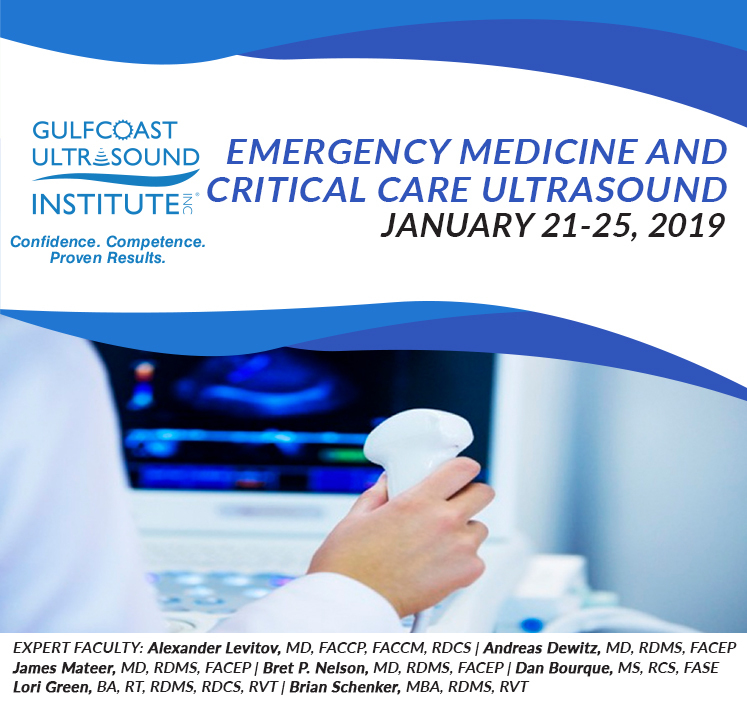 Gulfcoast Ultrasound Institute specializes in Emergency Medicine & Critical Care Ultrasound Training & CME Courses for Physicians, NP's, PA's, Sonographers, Military, EMS, and other Medical Professionals. Gulfcoast Ultrasound Institute is the most flexible and proven educator of ACCME Accredited Ultrasound CME in the continuing medical education industry. Whether you have never picked up an ultrasound transducer and are looking to integrate ultrasound into your day to day practice, experienced with using ultrasound but are looking to enhance your skills with more advanced Point of Care ultrasound training, or you are looking for an accredited Ultrasound CME course to obtain your required CME Credit, the Gulfcoast Ultrasound Institute Emergency Medicine and Critical Care Ultrasound Courses are the perfect choice for you. Click below or call 727.363.4500 to sign up for a course. 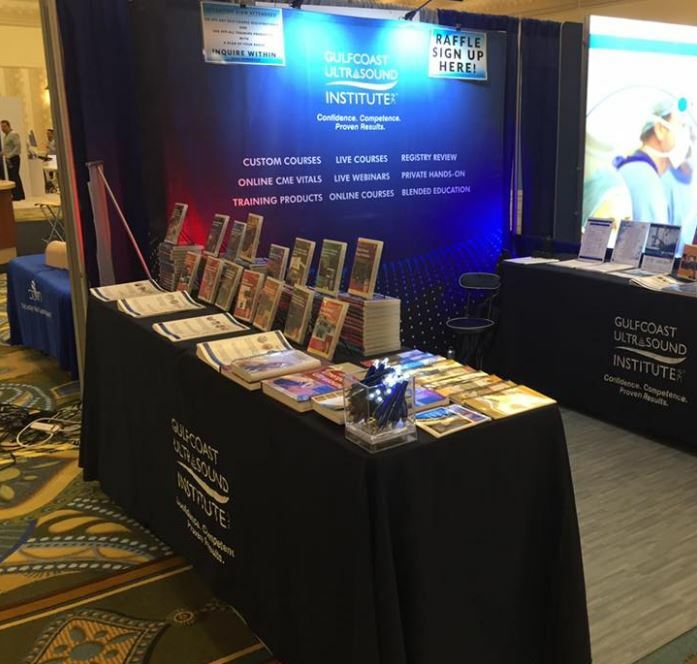 Gulfcoast Ultrasound Institute had a great time exhibiting at the AIUM 2019 in Orlando, Fl. Our booth was well visited and we had a great time meeting new and old Ultrasound Friends. See you next year! Find the Ultimate Echocardiography Training & CME Courses in 2 Minutes! 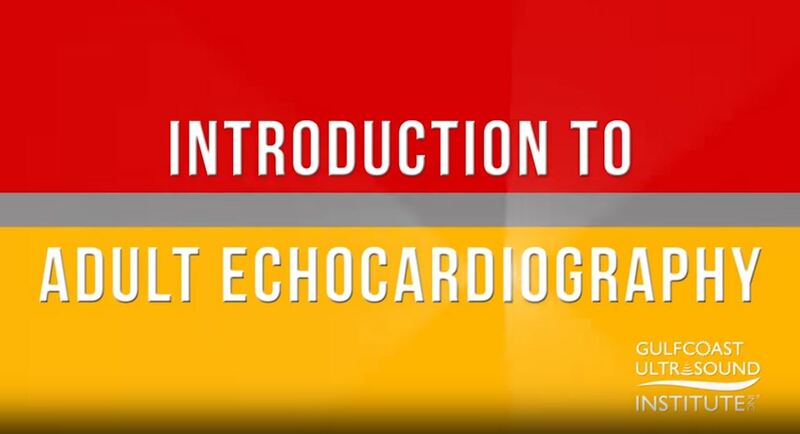 The Introduction to Adult Echocardiography Live Training & CME Courses are five (5) day echocardiography course in St. Petersburg, FL that are taught by leading echocardiography experts and are designed to provide a strong foundation to perform and/or interpret adult echocardiography examinations. The structure of the course is a combination of live lectures by echocardiography experts, a human heart cadaver lab, and industry leading hands-on scanning with a 3:1 participant to faculty ratio with live models. You will be scanning normal anatomy and pathology. Click below or call 727.363.4500 for more information. 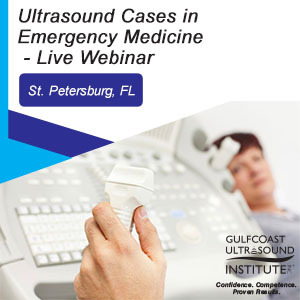 The Ultrasound Cases in Emergency Ultrasound Live Webinar is designed to review ultrasound characteristics and diagnostic criteria associated with pathology seen in the emergency setting. A variety of case studies will be reviewed including abdominal, cardiac, lung, pediatric abdomen/GI tract, soft-tissue, ocular, and GYN applications. Click below or call 727.363.4500 to sign up. 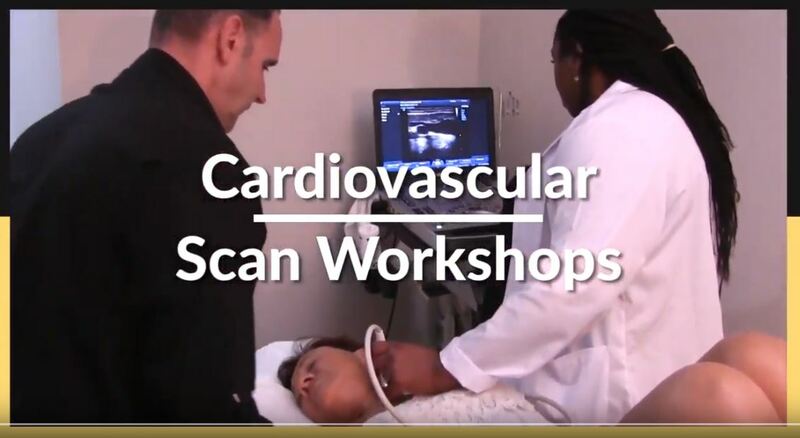 Gulfcoast Ultrasound Institute Cardiovascular Ultrasound Courses are designed to provide a strong foundation to perform and/or interpret cardiovascular ultrasound examinations. All Cardiovascular Ultrasound Courses are taught by leading experts in the fields of cardiac and vascular ultrasound. The blended cardiovascular ultrasound courses on May 16th-17th combine 15 months of unlimited access to the corresponding online course(s) for the most comprehensive lectures in the industry, plus one-two days of live hands-on scanning (depending on course) at the Gulfcoast Ultrasound Institute training and CME facility in St. Petersburg, Florida. The scan labs are state-of-the-art with ultrasound machines ranging from all of the leading manufacturers. The hands on instruction never exceeds our industry leading 3:1 participant to faculty hands-on scan ratio using live models for the most comprehensive, real life hands-on scanning experience. For the best overall ultrasoundtraining, completion of the online course(s) prior to hands on scanning is highly recommended. The Pediatric Emergency Medicine and Critical Care Ultrasound Live Training Course and Live Webinar is designed to increase the participant's knowledge and competence to perform and interpret pediatric ultrasound examinations in an emergency medicine and/or critical care setting. 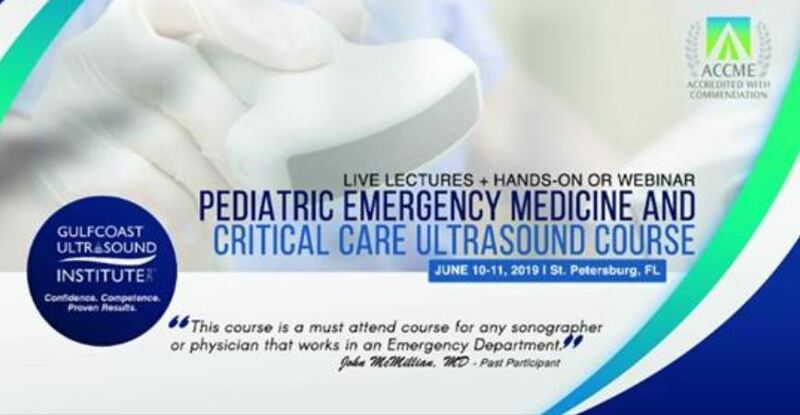 The Pediatric Emergency Medicine and Critical Care Ultrasound Course is taught by leading pediatric emergency medicine and critical care ultrasound experts. The live course structure includes lectures, interactive case presentations, and extensive hands-on scanning featuring our industry leading 3:1 participant to instructor scan ratio with live pediatric models and inanimate phantoms in our state-of-the-art lecture facility and scan labs in St. Petersburg, FL. 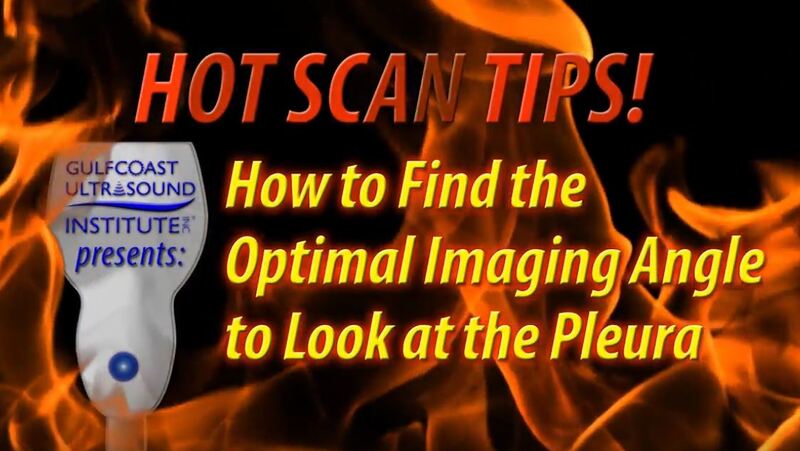 The live webinar does not include the hands on scan workshop. Private Ultrasound Education Fun in the Sun Anyone? Private Hands-On Ultrasound Courses are the ideal continuing medicine education format for medical professionals that prefer to learn in a 1 on 1 educational environment, or the dates of a regularly scheduled course won't work for their busy schedule. Private Hands-On Ultrasound Courses are combinations of a 15 month access Online Course, with a Private Hands-On Workshop scheduled to your availability at our facility in St. Petersburg, Florida. All Private Hands-On Courses, feature expert instructor(s), multiple live model patient(s), and are approved for AMA PRA Category I Credits™. After the workshop there are plenty of choices to enjoy from world class beaches, amusement parks, bustling nightlife, museums, sporting events, festivals and amazing events happening all of the time. Schedule your private ultrasound course today and experience the Gulfcoast difference! Click below for more information about our MSK Education. Gulfcoast Ultrasound Courses cover a variety of topics and applications invaluable to individuals involved in rapid decision making at the patient's bedside. Be able to have the essential skill of ultrasound to not have to move an unstable patient from an area where an acute need must be addressed. Rapidly perform an assessment using ultrasound to narrow down a list of differentials. -Use ultrasound to determine the most worthwhile diagnostic study to be performed on the individual. -Learn new and important skills to incorporate in your day to day practice. Whether you have never picked up an ultrasound transducer and are looking to integrate ultrasound into your day to day practice, are experienced with using ultrasound but are looking to enhance your skills with more advanced Point of Care ultrasound training, or you are looking for an accredited Ultrasound CME course to obtain your required CME Credit, the Gulfcoast Ultrasound Institute Emergency Medicine and Critical Care Ultrasound Courses are the perfect choice for you. Our Blended Cardiovascular Courses are designed to provide a strong foundation to perform and/or interpret cardiovascular ultrasound examinations. The Blended Cardiovascular Courses are taught by leading experts in cardiac and vascular ultrasound. These courses combine 15 months unlimited access to our online courses of the most comprehensive lectures in the industry, plus, either one or two days (depending on course) of live scanning at our facility in St. Petersburg, Florida. The scan workshops feature our industry leading 3:1 participant to faculty hands-on scan ratio using live models for the most comprehensive, real life hands-on scan time. For the best ultrasound education experience, completion of the online course(s) prior to hands on scanning is recommended. In this Gulfcoast Ultrasound Institute Hot Tip, Timothy Mazzola, MD, CAQSM, RMSK, describes how to ultrasound the coracohumeral ligament and rotator interval of the shoulder. Click on the image to watch the video. Click below for more information about our MSK Education. Are You Looking To Cross Train? Maybe a Refresher Course? Come Scan with us! Gulfcoast Ultrasound Institute (GCUS) is the most comprehensive, accredited resource for live and online diagnostic ultrasound training and CME. 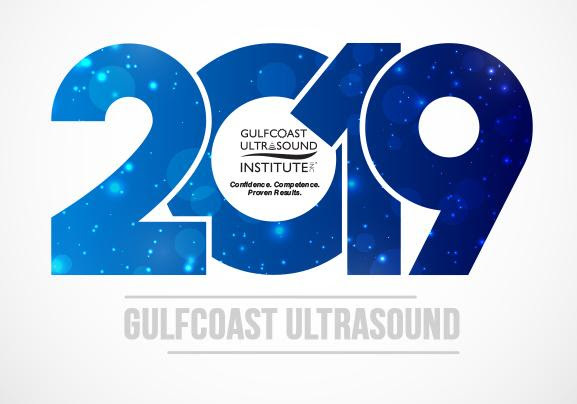 Since 1985, Gulfcoast Ultrasound has been dedicated to providing the highest quality continuing medical education and skills training in the diagnostic ultrasound profession. All activities are approved for AMA PRA Category 1 Credits™. 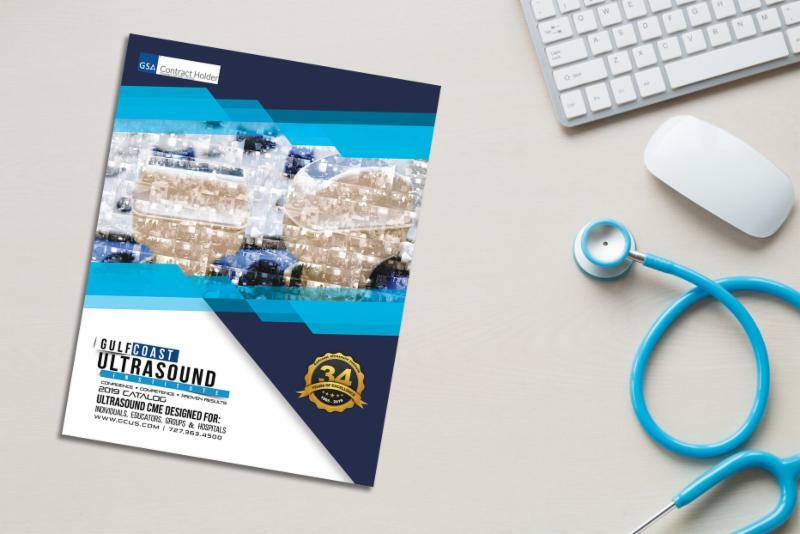 Located in St. Petersburg, Florida, Gulfcoast Ultrasound Institute has hosted over 145,000 physicians, sonographers, and other medical professionals with a broad range of educational options, and has awarded over 500,000 CME credits to participants worldwide. Gulfcoast Ultrasound Institute offers over 400 self-paced ultrasound training products in multiple learning formats. Gulfcoast Ultrasound Institute has recently added our latest learning format, blended ultrasound training. This format combines our comprehensive online classroom programs with live hands-on scanning workshops. Only the latest technology and innovative teaching methods are used at Gulfcoast Ultrasound to ensure learners receive the maximum educational benefit from each course and product offered. As a result, both seminars and educational products have received a 99.8% satisfaction rating for meeting or exceeding overall educational objectives. Gulfcoast Ultrasound Institute also receives consistent high ratings for the quality and amount of hands-on instruction that are offered to all participants... a key component to effective medical education. Registry Review with a 98% Exam Success Rate. Come Study With Us! Gulfcoast Ultrasound Institute is recognized as the world wide leader in registry review with an industry leading 98% Exam Success Rate! 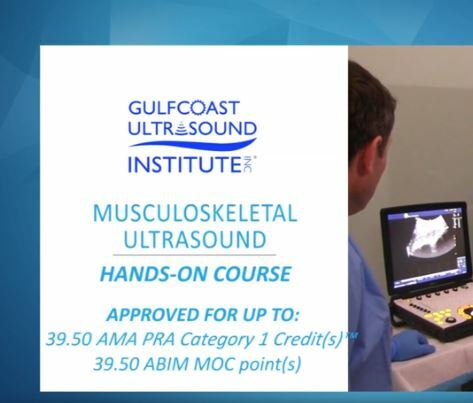 Whether you come to a live course at our facility in St. Petersburg, FL, or prefer to live web stream the course to anywhere in the world, or logging onto our custom learning management system (LMS) to take an online course you will see why hundreds of thousands of medical professionals choose Gulfcoast Ultrasound Institute for their registry review needs. Choose from any of our registry review workbooks, flashcards and mock exams, or packages to study from the comfort of your home. No matter how you learn, you can rest assure that you are learning from the leading registry review ultrasound experts in the world. No matter which focus you are looking for; Physics, OB/GYN, Pediatrics, Breast, Abdominal, Musculoskeletal (MSKUS), Adult Echocardiography, RPVI and Vascular, Gulfcoast Ultrasound Institute has registry review options for any learner on any budget to get you successfully through your boards the first time. All registry review courses and products are specifically designed for physicians, sonographers and other medical professionals who are looking to obtain their certification. All Gulfcoast Ultrasound Institute registry review courses and products are approved for AMA PRA Category 1 Credits™. The GCUS Registry Review PASS Guarantee offers you return access to the online course version of your registry review program for 90 days if you do not pass your registry exam after completing one of our review programs. Just send us a copy of your exam score (registry exam must be taken within six months of our review) and we'll grant you a 90 day access to the online course version of the review. 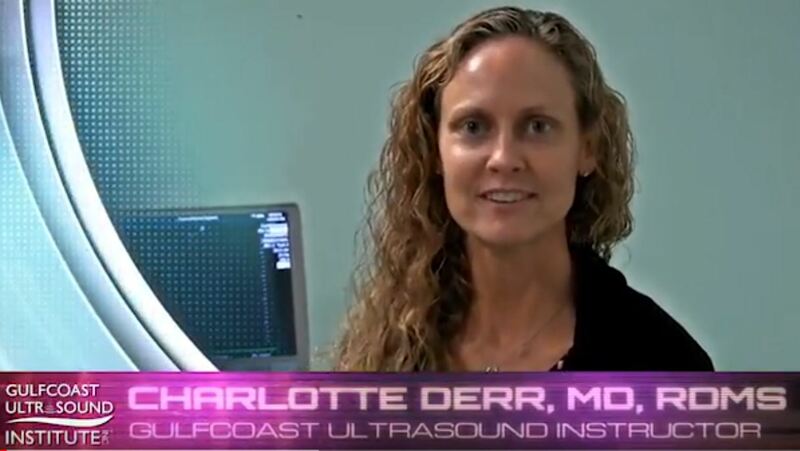 Gulfcoast Instructor Charlotte Derr, MD, RDMS, FACEP discusses the importance of ultrasound in emergency medicine and critical care. 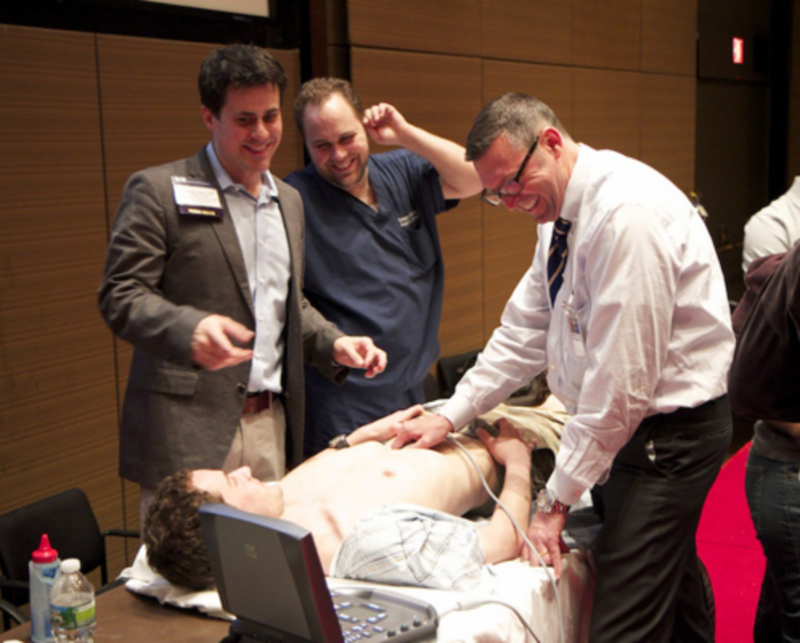 Don't miss out on the upcoming emergency medicine and critical care ultrasound courses this May. The Blended Introduction to Abdominal & Primary Care and OB/GYN CME Courses are comprehensive, yet flexible. This course covers a wide range of topics from abdominal, trauma, thyroid, scrotal, and soft-tissue applications, to transabdominal and endovaginal scan techniques and OB applications. 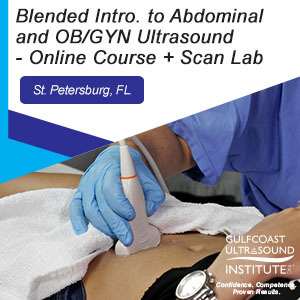 This course is taught by leading abdominal and OB/GYN ultrasound experts, while the blended format features fifteen (15) months unlimited access to the online courses, plus two (2) days (12 hours) of scan workshops at our facility in St. Petersburg, FL. 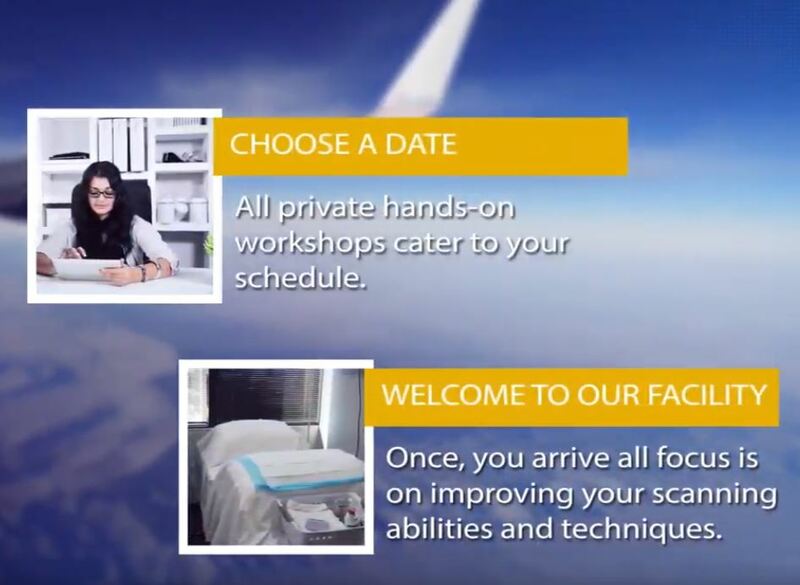 Scan Workshops offer our industry leading 3:1 participant to faculty hands-on scan ratio and live models (Abdominal, GYN and OB Models) for the most realistic and practical hands-on training experience. For the most effective ultrasound education experience, completion of the online courses prior to the hands on scan workshops is recommended. Ultrasound Evaluation of the Pancras. Presented By: Sal Larusso, M.Ed, RDMS, RT(R) (DVD & Online Video Format Available.) Approved for a maximum of: 1.25 AMA PRA Category 1 Credits™. To learn more about this product click below or call 727.363.4500. 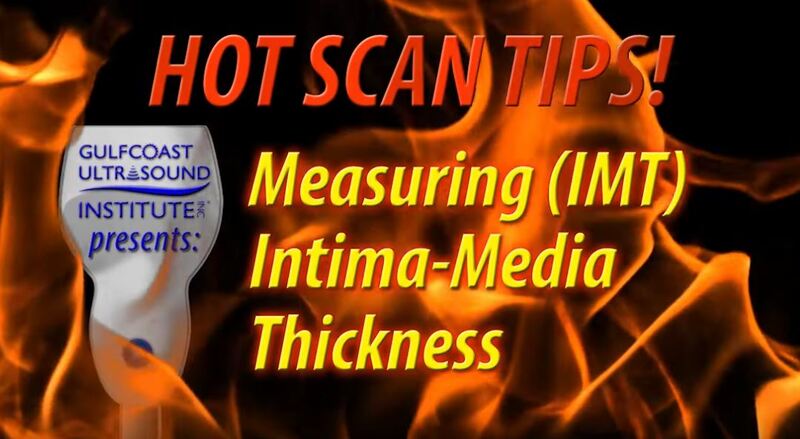 Gulfcoast Instructor Dr. Phillip Bendick, PHD, RVT, FSDMS explains how to find the intima media layer and perform a measurement of intima media thickness using ultrasound. See all of Gulfcoast Ultrasound Institute's Vascular Ultrasound CME Options here. How Does A Florida Spring Break [Sun & CME] Sound? 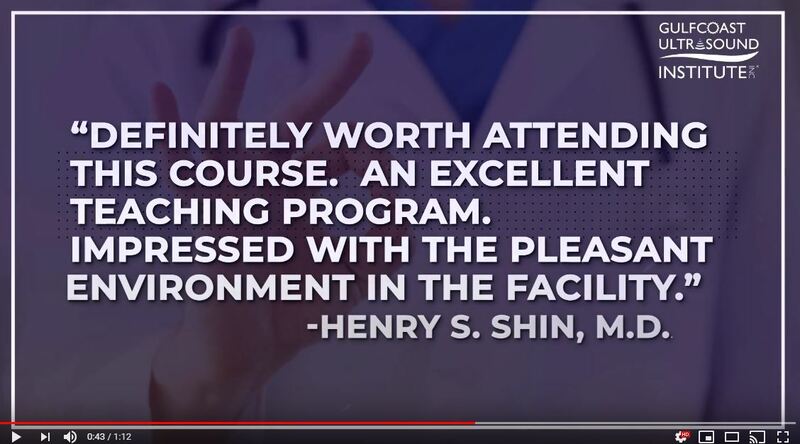 The Blended Introduction to Abdominal & Primary Care and OB/GYN Training Courses are comprehensive, yet flexible and cover a wide range of topics from abdominal, trauma, thyroid, scrotal, and soft-tissue applications, to transabdominal and endovaginal scan techniques and OB applications. Scan Workshops offer a 3:1 faculty to participant hands-on ratio and live models (Abdominal, GYN and OB models) for the most realistic and practical hands-on training experience. For the most effective ultrasound education experience, completion of the online courses prior to the hands on scan workshops is recommended. Click below or call 727.363.4500 for more information. (DVD & Online Video Format Available.) Approved for a maximum of: 1.00 AMA PRA Category 1 Credits™. The Registered Musculoskeletal Registry Review Online Courses are designed to prepare physicians, clinicians, and sonographers to successfully take their respective Ultrasound Registry Exams. Upper and lower extremity joints are covered in great detail, along with multiple mock examinations. Presentations include anatomy/physiology, scan protocols and normal sonographic characteristics, pathology, integration of data and treatment/interventional techniques. 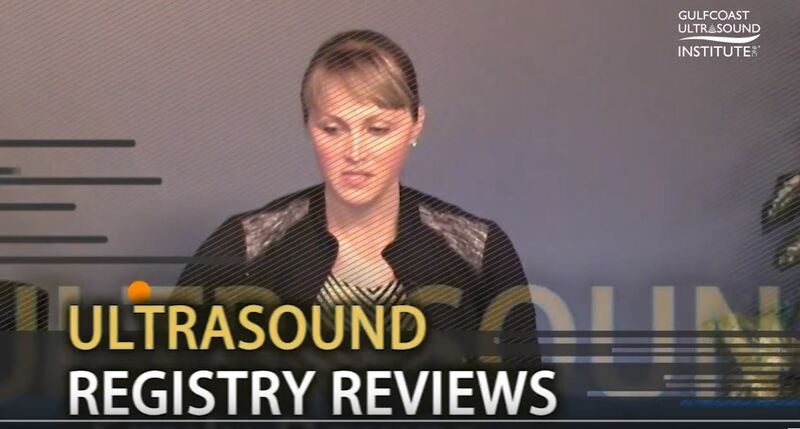 The RMSK Registry Review Online Course for physicians is specifically designed to also provides a comprehensive review of Sonography Principles & Instrumentation (Physics) since 28% of that exam pertains to ultrasound physics. The RMSK online course is the ideal choice for examination preparation, plus reinforcement of interpretation skills to improve competence and confidence to perform and/or interpret MSK ultrasound examinations. Additionally, the Gulfcoast Registry Review PASS Guarantee offers you access to your online course for an additional 90 days if you do not pass your registry exam after completing your online course. Just send us a copy of your exam score (registry exam must be taken within six months of our review) and we'll grant you an additional 90 day access to your online course. How to Evaluate Abdominal Pain in a Pediatric Patient - Appendicitis or Constipation? 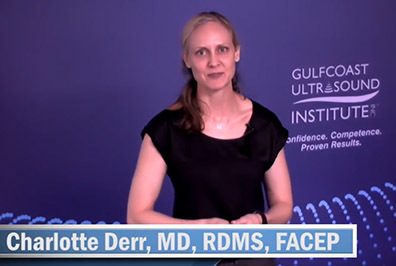 Gulfcoast Ultrasound Instructor Stephanie Doniger, MD, RDMS, FAAP, FACEP demonstrates how to evaluate pediatric abdominal pain, and how to differentiate appendicitis from constipation using ultrasound. Are you in need of Pediatric Emergency Medicine & Critical Care Ultrasound Training? Check out the Live Course and Webinar coming up in June. Craig Chappell, DO, RMSK in last week's Advanced/Interventional MSK Ultrasound with Regenerative Medicine Track Course demonstrating a live procedure. Learn more about MSK Ultrasound Training from Gulfcoast with a click or call. Early Bird Registration (-$200) is open for the Pediatric Emergency Medicine and Critical Care Ultrasound Training Course this June. Learn from the experts who write the books. Gulfcoast Faculty, Jeff Strakowski, MD, and Tim Mazzola, MD, RMSK (Left) with a couple of last week's Advanced/Interventional MSKUS with Regenerative Medicine Course Participants. Your One Stop Shop for Ultrasound Training & CME. Click to experience the Gulfcoast Difference. Ultrasound Guided Regional Anesthesia Live Training Course is designed for medical professionals seeking to integrate ultrasound-guided regional anesthesia techniques for surgery, pain management, or procedural applications such as fracture reduction into their clinical practice. These courses are taught by leading anesthesiologists and emergency medicine ultrasound experts that incorporates comprehensive lectures and interactive case presentations that features a 3:1 faculty to participant hands-on scan ratio with both live models (anatomy) and inanimate phantoms (interventional techniques). This course is specifically designed for physicians, sonographers and other medical professionals who need ultrasound guided regional anesthesia (UGRA) training in a surgical and pain management setting. Do you need Ultrasound training and CME, but can't get the time to get away from work, or family? We certainly can understand juggling life and career. Not to worry, Gulfcoast Ultrasound Institute has you covered with our Webinar Series. Throughout every year, we offer convenient, live, interactive webinars on a number of hot topics in the ultrasound field, as well as many full courses and every registry review. Check out our live webinars to see when your perfect webinar will be streaming and register today! 5% Off All 2019 Course Registrations To Our Beloved Alumni. Examine all of our 2019 Courses to see which course will benefit you the most. These specials are good until March 1st! Experience the Gulfcoast Difference. Learn From The Experts Who Wrote The Textbooks. With the demands of today's medical professionals, Gulfcoast Ultrasound Institute certainly understands that you may not have the flexibility in your schedule to attend one of our regularly scheduled live courses. In this case, we are proud to offer Blended Ultrasound Education & CME. Blended Education combines one of our comprehensive, Online Courses (15 Months Unlimited Access) with a 1 or 2 day scan workshop that features an industry leading 3:1 participant to instructor hands-on scanning ratio. 12 months UNLIMITED access from your computer, tablet, smart phone, TV, etc. No lockouts, or hidden limitations after a certain amount of views. Group pricing is available for groups of 5 or more (Not Valid for Registry Reviews). Add a Custom Onsite Hands-On Course for training consistency, time and cost effectiveness, with the highest quality ultrasound training in the industry. Private Hands-On Courses are also available for the learner who prefers the 1-1 learning format. Receive 3 additional months of unlimited online access (Not Valid for Registry Reviews) with a Private Hands-On Course. See our Private Hands-On Course Learning Format for more details. The All New GCUS 2019 Course and Product Catalog is at the Press, and the Digital Version is up on www.gcus.com. 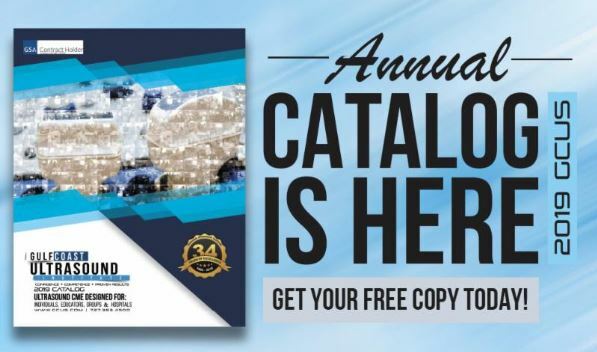 View the Digital Version and submit a catalog request. We'll ship one out to you for FREE! Click below or call 727.363.4500 to get yours. Don't Miss Out! Next Week is the FINAL Week to Register for our Most Comprehensive MSK Courses! Fight the Opioid Epidemic with our Ultrasound-Guided Nerve Block Course! The Ultrasound Guided Nerve Blocks for Emergency Medicine Live Training Course & Webinar is designed for medical professionals seeking to integrate ultrasound-guided nerve block techniques into their emergency medicine or critical care practice. 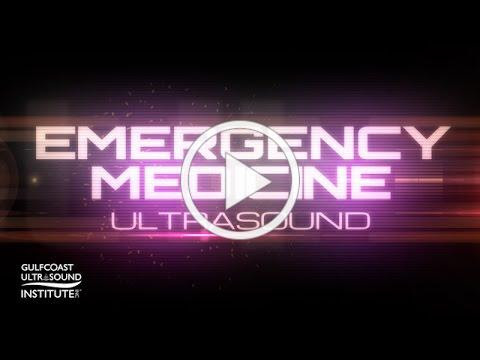 These courses are taught at our facility in St. Petersburg, Florida and streamed to any device in the world with an internet connection by leading emergency medicine ultrasound experts that specialize in Ultrasound Guided Nerve Blocks for Emergency Medicine. This course incorporate comprehensive lectures covering upper and lower extremity blocks and interactive case presentations with an Audience Response System that features a 3:1 faculty to participant hands-on scan ratio with live models and phantoms. All participants will immediately be able to implement skills learned into clinical practice and see an increase in diagnostic skills and scanning proficiency. With the demands of today's medical professionals, Gulfcoast Ultrasound Institute certainly understands that you may not have the flexibility in your schedule to attend one of our regularly scheduled live courses. In this case, we are proud to offer Blended Ultrasound Education & CME. Blended Education combines one of our comprehensive, Introduction or Advanced Online Courses (15 Months Unlimited Access) with a 1 or 2 day scan workshop that exclusively features a 3:1 participant to instructor hands-on scanning ratio. The Blended Introduction to Abdominal and OB/GYN Training Courses cover a wide range of topics from abdominal, trauma, thyroid, scrotal, and soft-tissue applications, to transabdominal and endovaginal scan techniques and OB applications. 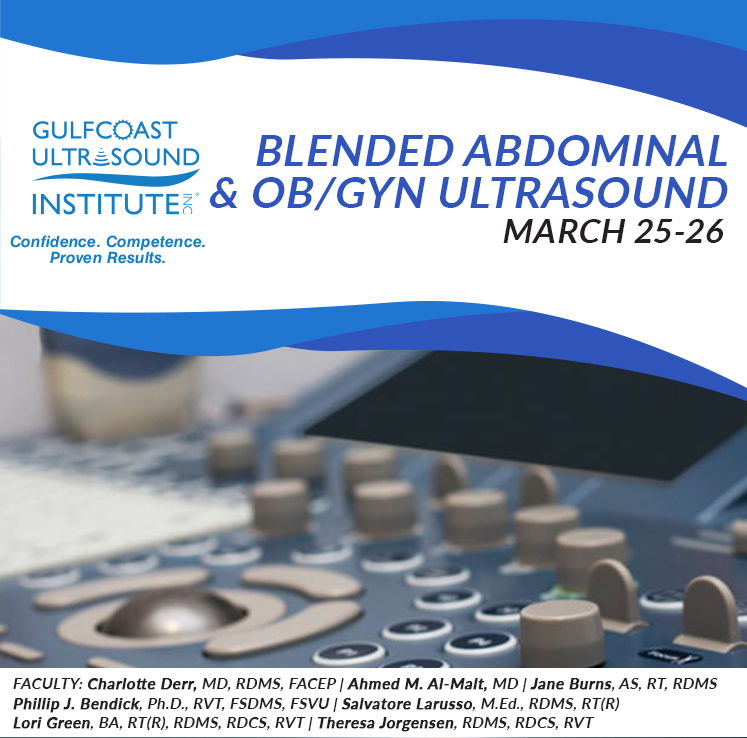 These courses are taught by leading abdominal and OB/GYN ultrasound experts that offers fifteen (15) months unlimited access to the online courses, plus two (2) full day (12 hours) scan labs with a 3:1 faculty to participant hands-on scan ratio at our facility in St. Petersburg, FL. During these courses, participants will learn ultrasound tips, tricks and techniques for the entire abdominal and OB/GYN ultrasound spcialties. For the best ultrasound education experience, completion of the online courses prior to attending the hands-on scanning workshop(s) is recommended. Gulfcoast Ultrasound Institute is recognized as the world wide leader in Vascular Interpretation and RPVI Registry Review. 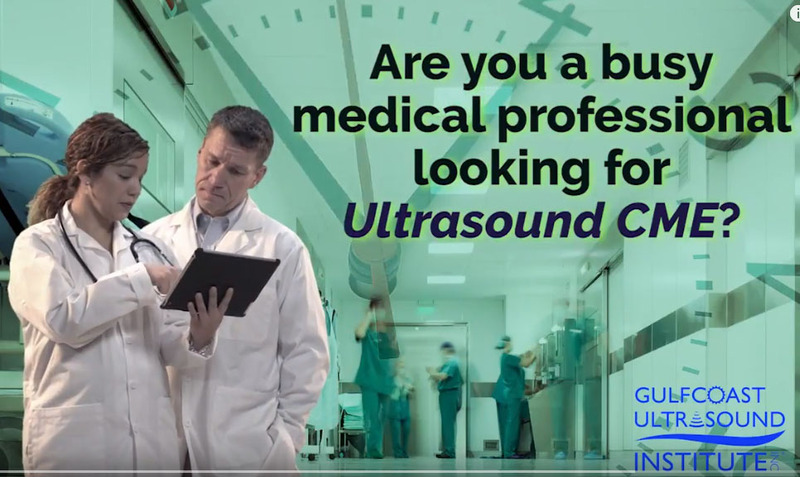 Whether you come to the live course at our facility in St. Petersburg, FL, or prefer to live web stream it from the comfort of your home or convenience from your facility/office, you will see why hundreds of thousands of medical professionals choose Gulfcoast Ultrasound Institute for their registry review needs. 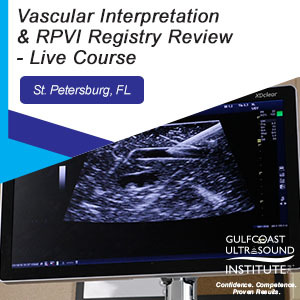 The Vascular Interpretation and RPVI Registry Review Course and Webinar are specifically designed for physicians, sonographers and other medical professionals who are looking to obtain more knowledge in vascular interpretation and/or prepare for their RPVI Registry Exam. The RPVI Registry Review Course and Webinar are ACCME Accredited and approved for AMA PRA Category 1 Credits™. With the GCUS Registry Review PASS Guarantee we offer you return access to the online course version of the RPVI Registry Review for 90 days if you do not pass your registry exam after completing the live course or webinar. Register today, It's a snap! Gulfcoast Ultrasound Instructor, Imran Siddiqui, MD, RMSK demonstrates how to evaluate the medial meniscus using ultrasound. 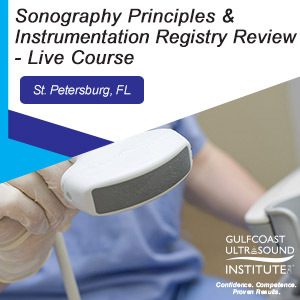 Physics / Sonography Principles & Instrumentation (SPI) Registry Review provides a comprehensive review with topics based on ARDMS Exam content outlines for successfully completing the Physics / Sonography Principles & Instrumentation (SPI) certification exam. To guarantee the highest industry exam success rate this course is taught by leading Physics/ Sonography Principles & Instrumentation (SPI) Registry Review Experts. The Abdominal Ultrasound Registry Review Course provides a comprehensive review with topics based on ARDMS exam content outlines for successfully completing the abdominal certification exam. To guarantee the highest industry exam success rate this course is taught by leading Abdominal Ultrasound Registry Review Experts. Both courses entail interactive lectures, case studies, and live, interactive mock registry exams using an interactive Audience Response System at our facility in St. Petersburg, FL. All participants will receive a BONUS 5 DAY ACCESS to the Online Registry Review Course (Only offered by Gulfcoast Ultrasound Institute). Additionally, the GCUS Registry Review PASS Guarantee offers you access to the online course version of your registry review program for 90 days if you do not pass your registry exam after completing one of our review programs. The Vascular Interpretation and RPVI Registry Review Course is taught by leading vascular ultrasound experts that includes interactive case studies & mock exams with a 99% RPVI Board Exam Pass Rate. The Vascular Interpretation and RPVI Registry Review Course is designed for medical professionals to improve their vascular interpretation skills and/or prepare to take the Registered Physician in Vascular Interpretation (RPVI) board examination. This vascular ultrasound program includes lectures based on APCA content outlines, interactive case presentations, and mock examinations using an audience response system to improve diagnostic confidence and competence. 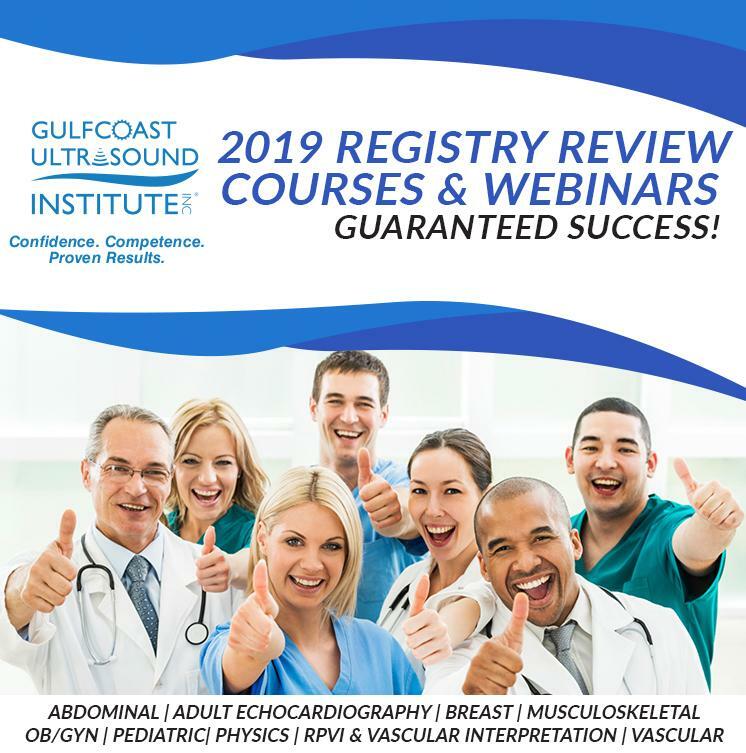 *BONUS* All participants receive an extra 5 Day Access to our Online Registry Review Course (Only Offered by Gulfcoast Ultrasound Institute). We have the Musculoskeletal Ultrasound Courses you're looking for. Register Today, 90% Sold Out! Learn Musculoskeletal Ultrasound from the Physicians who wrote the textbooks. Musculoskeletal Ultrasound Training Courses at Gulfcoast Ultrasound Institute are taught by the nation's leading Musculoskeletal Ultrasound Experts. You will enjoy our industry leading 3:1 faculty to participant hands-on scan ratio at our state-of-the-art facility in St. Petersburg, Florida. The Gulfcoast Musculoskeletal Ultrasound Training and CME Courses are specifically designed for physicians, sonographers and other medical professionals who are in need of the finest Musculoskeletal Ultrasound Training and CME in the Industry. 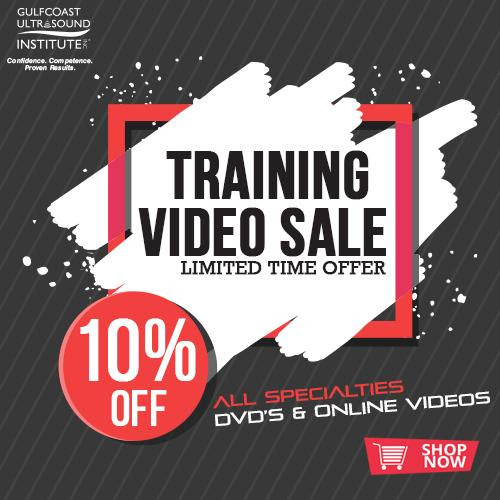 GCUS offers Musculoskeletal Ultrasound Training Courses ranging from introductory level through advanced, with and without cadaver labs, plus regenerative medicine courses with live patient procedures (Only Offered at Gulfcoast Ultrasound Institute). All MSK Ultrasound Courses can be combined for our most comprehensive Musculoskeletal Ultrasound Training and CME Program. In the combined week long Musculoskeletal Ultrasound Programs participants will learn the latest in ultrasound techniques, protocols, tips, tricks, strategies and methodology for the entire Musculoskeletal System. GCUS Medical Director, James Mateer, MD, RDMS in Introduction to Emergency Medicine and Critical Care Ultrasound Course with a couple of this week's participants. Interested in this course, but could not make it this week? Not a problem. The next course is in September. Registration is now open. The Focused Cardiac Ultrasound: Differential Diagnosis of Shock in Trauma Live Webinar, presented by James Mateer, MD, RDMS will provide an overview of basic cardiac views to supplement the FAST Exam with case examples of how to differentiate causes of shock and identify cardiac complications in Trauma patients. Looking for the most comprehensive MSK Ultrasound Training in the Industry? We have you covered! Learn Musculoskeletal Ultrasound from the Masters who wrote the textbooks. Musculoskeletal Ultrasound Training Courses at Gulfcoast Ultrasound Institute are taught by the nation's leading Musculoskeletal Ultrasound Experts. You will enjoy our industry leading 3:1 faculty to participant hands-on scan ratio at our state-of-the-art facility. 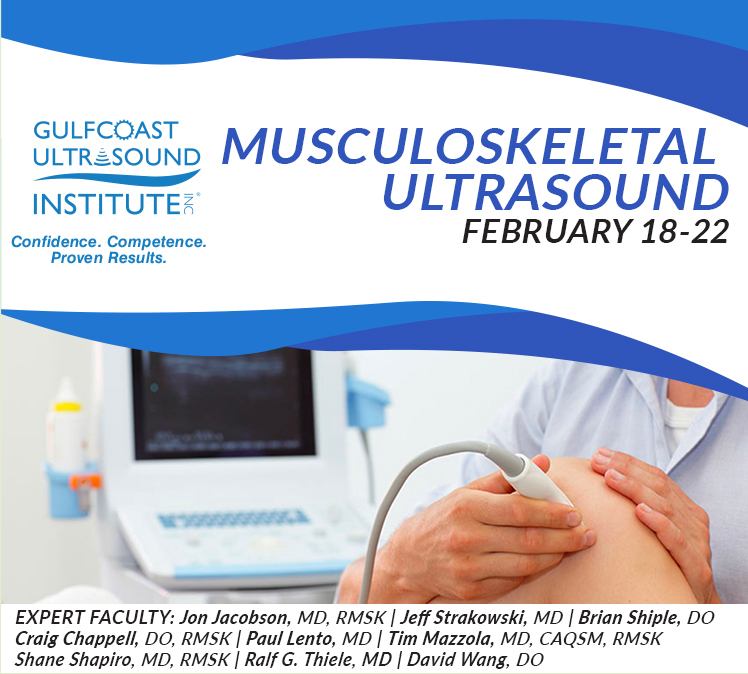 The Gulfcoast MSK Ultrasound Training and CME Courses are specifically designed for physicians, sonographers and other medical professionals who are in need of the finest MSK ultrasound training and CME. All MSK courses can be combined for our most comprehensive musculoskeletal ultrasound training and CME program. In the combined week long musculoskeletal programs participants will learn the latest in ultrasound techniques, protocols, tips, tricks, strategies and methodology for the entire musculoskeletal system. 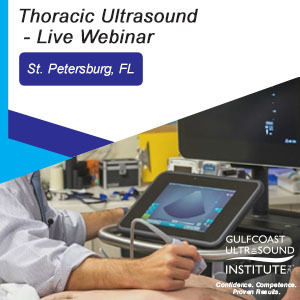 The Thoracic Ultrasound Live Webinar is designed to review the fundamentals and advanced applications related to ultrasound evaluation of the lung. Assessment of pneumothorax, pleural effusion, A-lines, B-lines, pulmonary edema, and commonly seen artifacts that may affect diagnostic accuracy are included. In addition, evaluation of acute respiratory failure and the role of ultrasound in airway assessment acute circulatory failure using lung ultrasound will also be discussed. Gulfcoast Ultrasound Institute is recognized as the World Wide Leader in Emergency Medicine & Critical Care [Point of Care/POCUS] Ultrasound Training and CME. The Live Emergency Medicine and Critical Care Ultrasound Courses are an equal mix of comprehensive, didactic lectures, plus industry leading 3:1 hands-on scan workshops with expert level faculty at our facility in St. Petersburg, FL. All Emergency Medicine & Critical Care Ultrasound Courses are specifically designed for Physicians, Sonographers and other Medical Professionals who desire only the best in Emergency Medicine & Critical Care Ultrasound Training and CME. 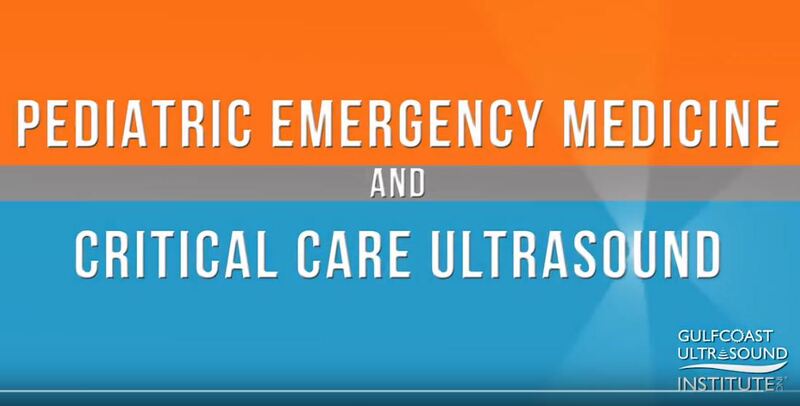 Click on the image to watch the video and learn about the importance of ultrasound in emergency medicine and critical care. Sun, Surf, Sand, Sonography & CME! The Blended Introduction to Abdominal and Primary Care Ultrasound Training Course covers abdominal, trauma, thyroid, scrotal, and soft-tissue applications. 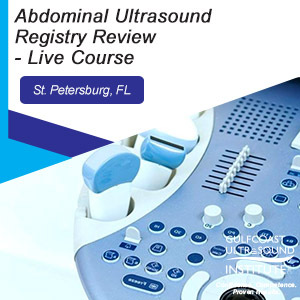 This course is taught by leading abdominal & primary care ultrasound experts, that offers fifteen (15) months unlimited access to the online course, plus (1) one full day scan lab (6 Hours) with a 3:1 faculty to participant hands-on scan ratio at our facility in St. Petersburg, FL. For the best ultrasound education experience, completion of the online course prior to hands on scanning is recommended. The Blended Introduction to OB-GYN Ultrasound Training Course is taught by leading experts covering transabdominal and endovaginal scan techniques, as well as OB applications. The Blended Introduction to OB-GYN Ultrasound Training Course offers fifteen (15) months unlimited access to the online course, plus one (1) Day (6 Hours) scan lab with a 3:1 faculty to participant hands-on scan ratio at our facility in St. Petersburg, FL. For the best ultrasound education experience, completion of the online course prior to hands on scanning is recommended. Click below or call 727.363.4500 to learn more. 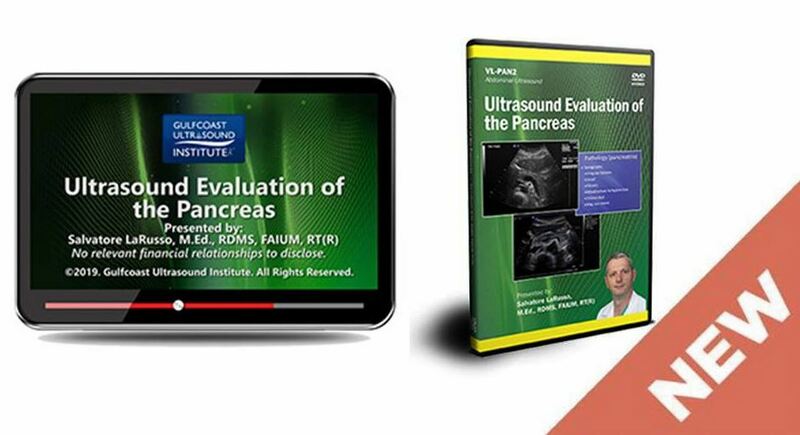 We Have The Ultrasound Training Video You're Looking For. Happy Holidays from all of us here at Gulfcoast Ultrasound Institute. Get festive and CME while taking advantage of our ultrasound training video sale. 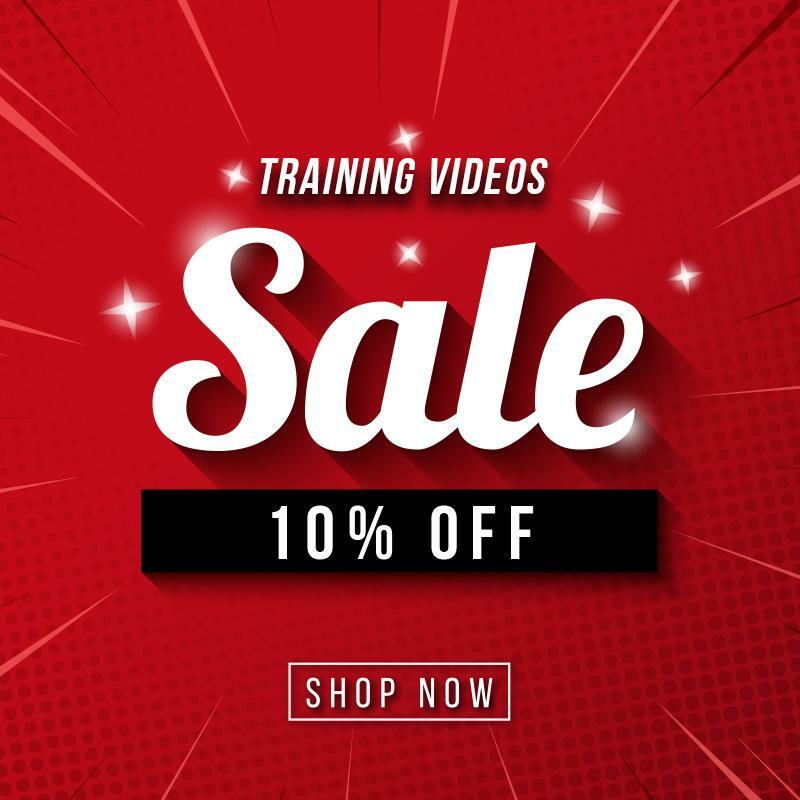 Enjoy 10% off all training videos (DVD and Online) through the end of the year. 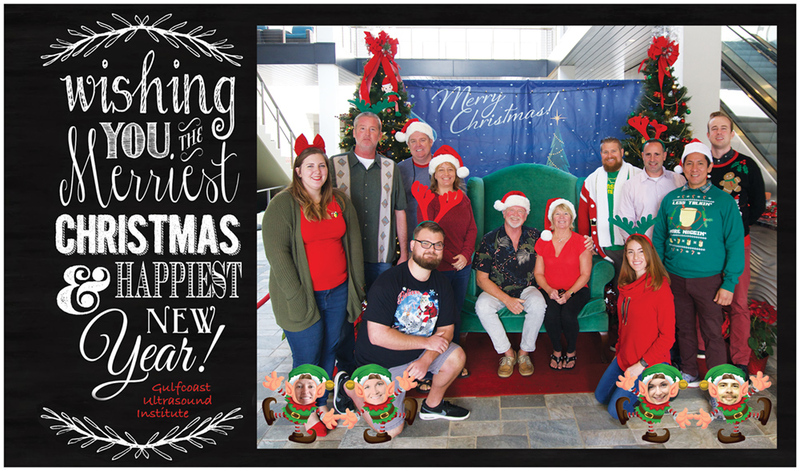 Happy Holidays from Gulfcoast Ultrasound Institute! With the weather outside so frightful, grab a training video that's so delightful. Presented By: Ahmed M. Al-Malt MD. Fetal Anomalies Training Video is designed to provide a review of fetal anomalies including malformations compared to normal anatomy, within fetal organs, and the pathogenesis. (DVD & Online Video Format Available.) Approved for a maximum of: 2.50 AMA PRA Category 1 Credits™. WHO SHOULD VIEW: Sonographers, physicians, nurse practitioners, PA’s and other medical professionals performing and / or interpreting OB ultrasound examinations. Physicians may include (but are not limited to): OB/GYN, Primary Care, Emergency Medicine, and Family Medicine. 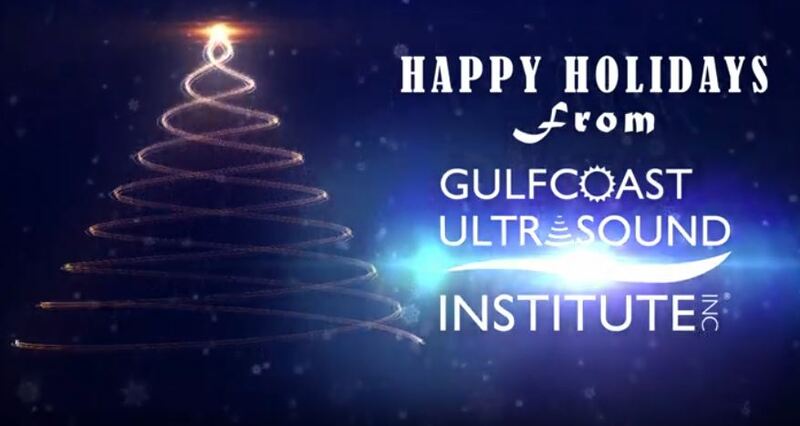 Happy Holidays from Gulfcoast Ultrasound Institute. Enjoy TWO FREE CME CREDITS this Holiday Season. Click the links below and you're on your way towards 2 FREE AMA PRA Category 1 Credits. 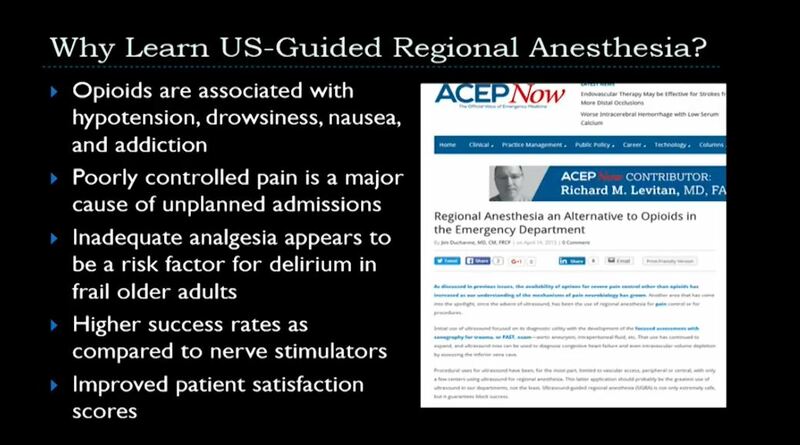 Benefits of Ultrasound-Guided Regional Anesthesia in the Emergency Department training video provides an overview of how to integrate ultrasound-guided regional anesthesia into the emergency medicine department. You will be shown the many benefits it provides to the patient, practitioner, and facility. For more comprehensive training in these procedures, we recommend attending the live course, blended course or participate in the online course. Point-Of-Care Ultrasound for the Sonographer training video is presented as a case-based PowerPoint presentation and includes discussion of the sonographer's role and use of ultrasound for evaluation of trauma, shock & hypotension, cardiac arrest, lung, foreign body localization, fracture assessment and MSK applications. Gulfcoast Ultrasound Institute is recognized as the world wide leader in Emergency Medicine & Critical Care [Point of Care/POCUS] ultrasound training and CME. The Live Emergency Medicine and Critical Care courses are an equal mix of comprehensive, didactic lectures, plus 3:1 hands-on scan workshops at our facility in St. Petersburg, FL. All emergency medicine & critical care ultrasound courses are specifically designed for physicians, sonographers and other medical professionals who need only the finest in emergency medicine & critical care ultrasound training. Choose between Introduction to Emergency Medicine, Introduction to Critical Care, or Advanced Emergency Medicine & Critical Care courses. Maximize your education, and get the best value with our combine and save course discounts. Click or call 727.363.4500 to learn more. Do you need quick, AFFORDABLE CME Credits with immediate certificate access? We have you covered with our CME Vitals!! For those that are waiting until the 11th hour to sneak in some last minute CME Credits before the end of the year, we have the perfect solution for you. Each Vital takes less than an hour to complete, affordable, easy to access online, and have instant proof of completion. or call 727.363.4500 to learn more. With a >98% Registry Exam Success Rate why go anywhere else? At Gulfcoast Ultrasound we guarantee your success of your board exams after our registry review courses and webinars. Choose between live courses, live webinars, online courses, and study products ranging from workbooks, mock exams, and flashcards. Spring Break: Sun, Surf Sand & CME! Secure your spot for our popular Blended Ultrasound Education Courses for Abdominal/Primary Care & OB/GYN. Enjoy 15 months unlimited access to the online course(s) and 3:1 hands on scanning in our state of the art scan labs. Maximize your stay and take advantage of the best weather of the year and our close proximity to our world class beaches, parks, and downtown activities. Enjoy 2018 Early Bird Course Enrollment Discounts Now! Click or call to learn more. follow this link. 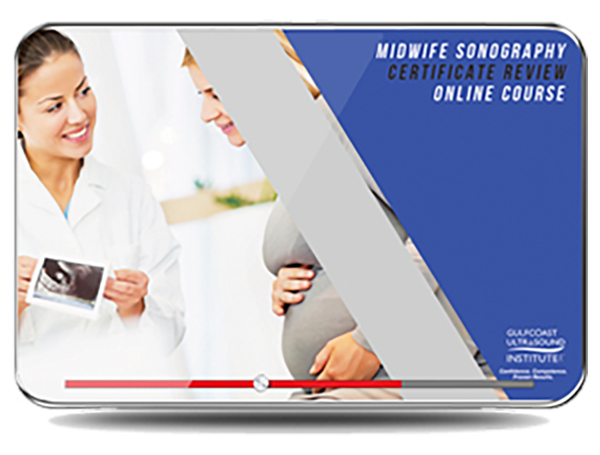 Midwife Sonography Certificate Review Online Course is designed for nurse midwives who are preparing to take the ARDMS midwifery focused examination. It is also beneficial for OB-GYN physicians who need a review of OB-GYN ultrasound techniques and/or to ensure the ultrasound practice protocols implemented are consistent with published guidelines for physicians and midwife practitioners Click or call to learn more. follow this link. Gulfcoast Ultrasound Institute is recognized as the world wide leader in Emergency Medicine & Critical Care [Point of Care/POCUS] ultrasound training and CME. The Live Emergency Medicine and Critical Care courses are an equal mix of comprehensive, didactic lectures, plus hands-on scanning ratios at our facility in St. Petersburg, FL. Gulfcoast Ultrasound Institute is most famous for our industry leading 3:1 faculty to participant hands-on scan ratio that maximizes your time scanning both live models and phantoms. All emergency medicine & critical care ultrasound courses are specifically designed for physicians, sonographers and other medical professionals who need only the finest in emergency medicine & critical care ultrasound training. Choose between Introduction to Emergency Medicine, Introduction to Critical Care, or Advanced Emergency Medicine & Critical Care courses. Maximize your education, and get the best value with our combine and save course discounts. Click or call to learn more. follow this link. New Product Announcement. Introduction to OB Sonography By: Salvatore LaRusso, M.Ed. RDMS, RT(R)(DVD & Online Video Format Available.) Approved for a maximum of: 1.25 AMA PRA Category 1 Credits™. WHO SHOULD VIEW: Sonographers, physicians, nurse practitioners, PAs, or other medical professionals performing and/or interpreting first trimester obstetrical sonography. Physicians may include (but are not limited to): OB-GYN, family medicine, internal medicine, emergency medicine, and radiology. Click or call to learn more. follow this link. MSK Imaging Fundamentals Presented By: Lori Green, BA, RT, RDMS, RDCS, RVT (DVD & Online Video Format Available.) Approved for a maximum of: 1.50 AMA PRA Category 1 Credits™. To learn more about this product head over to: Link. Musculoskeletal Ultrasound Training Courses at Gulfcoast Ultrasound Institute are offered twice a year. These courses are taught by the nation's leading Musculoskeletal ultrasound experts. You will enjoy our industry leading 3:1 faculty to participant hands-on scan ratio at our state-of-the-art facility. The Gulfcoast MSK Ultrasound Training and CME Courses are specifically designed for physicians, sonographers and other medical professionals who are in need of the finest MSK ultrasound training and CME. GCUS offers musculoskeletal ultrasound training courses ranging from the introductory level through advanced, with and without cadaver labs, plus regenerative medicine courses with live patient procedures. 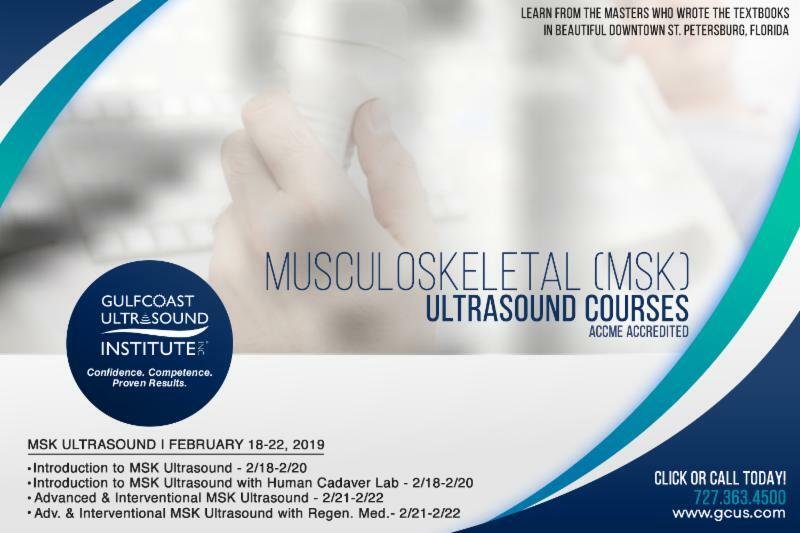 (Only Offered at Gulfcoast Ultrasound Institute) All MSK courses can be combined for our most comprehensive musculoskeletal ultrasound training and CME program. In the combined week long musculoskeletal programs participants will learn the latest in ultrasound techniques, protocols, tips, tricks, strategies and methodology for the entire musculoskeletal system. Click or call to learn more. follow this link. Need Quick, AFFORDABLE CME Credits for your Triennium? Running out of time for some last minute CME Credits? Check out our fast, affordable, online CME Vitals! Short online articles, designed to be completed in about an hour. Vitals are available in pretty much every specialty of ultrasound. Click or call to learn more. follow this link. Dr. Nelson is an Associate Professor of Emergency Medicine and the Director of the Emergency Medicine Ultrasound Division at Mount Sinai in New York. He is Chief Editor of the ultrasound education website, www.SinaiEM.us . He is coauthor of the Manual of Emergency and Critical Care Ultrasound as well as the Emergency Medicine Oral Board Review Illustrated (Cambridge University Press). He serves on the Board of Directors of the World Interactive Network Focused on Critical Ultrasound (WINFOCUS) and as Chair of the American Institute of Ultrasound in Medicine’s Point of Care Community of Practice. He is a member of the national faculty of the American College of Chest Physicians’ ultrasonography course, as well as The Difficulty Airway Course. He is active in the American College of Emergency Physicians (ACEP)'s Ultrasound Section and was among the authors of ACEP's 2008 Emergency Ultrasound Guidelines.